Anything to boost productivity and reduce time spent emailing is a big win in my book. 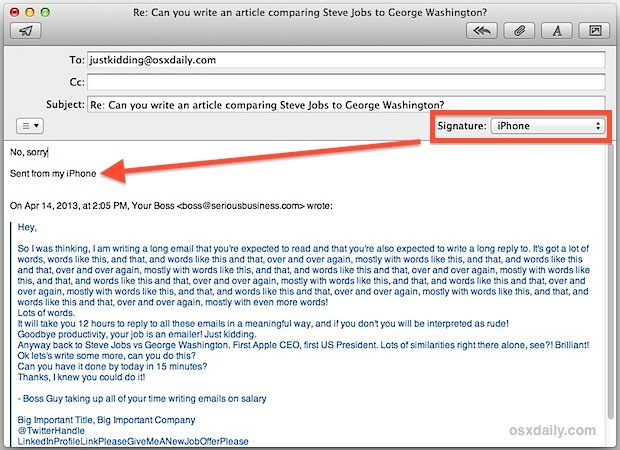 Accordingly, the “Sent from my iPhone” signature attached to an email has become associated in everyones minds with brevity, since naturally nobody expects a lengthy email reply sent while on the go from a smartphone, right? As a result, short replies from smartphones and iPhones are not considered rude or overly brief, and you can use that expectation of a brief and concise message to your advantage when sending emails from the Mail app of OS X. This is a great way to improve your email productivity when writing and replying from the desktop, and while some people call it a brand vanity signature, I like to call it the “brevity signature”. Sure, some people don’t like it and would rather remove the “Sent from my iPhone” signature even from their iPhones and iPads, but if you struggle with email fatigue and replying to hoards and hoards of emails, I highly recommend not only leaving it in place in iOS, but expanding it to the desktop, and that’s what we’re going to cover. We’re going to focus on adding this signature to the default Mail app that comes with Mac OS X. If you’re a regular reader, you may have noticed we have recommended this before in a group of Gmail tips, if you prefer to use webmail check that out instead. Don’t choose “All Signatures” when creating the signature from the left hand side menu since that it will not always be accessible. Be sure to select the mail account you use, or want to use, the brevity signature with. 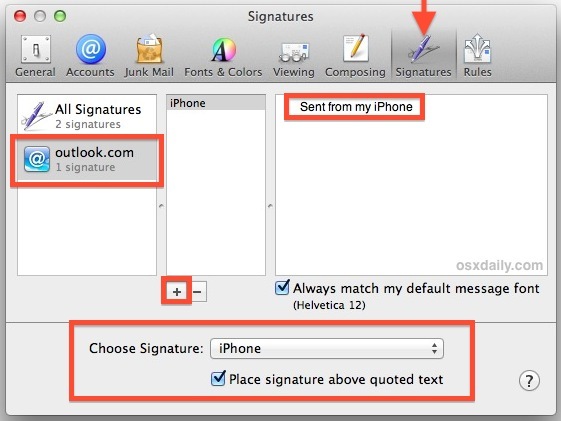 In this example, the signature has been applied to an Outlook.com account that has been set up for use in Mail app. One note: the signature location may vary slightly on an iPhone depending on how the message is quoted, but generally speaking it is always applied directly below your message, and not the entire message. In this example, the self-proclaimed Brevity Signature is attached to a length email reply, along with an extremely short response. Our brevity signature makes it feel ok! Again, the intention here is to feel more comfortable offering short, direct, and concise replies to incoming emails, thus improving your email productivity and freeing up time to do other more important work (unless you get paid to email all day, of course). Do you have any email productivity tips to manage the onslaught of messages we all get on a regular basis? Let us know in the comments! I knew what this would be before even reading the article and I have this set on everything for exactly the reasons you describe. I kid you not, it saves me at least an hour or two every day. One or two sentence replies are good enough for emails, if it’s important, we’ll be on the phone. Keep it simple, people! Email has become cumbersome and annoying because people write essays and expect one in return, it’s a bad habit that needs to be broken. My email client shows me what email client was used to send each message. So, this would show me that you used e.g. Mail.app but your signature says it was sent from your iPhone… Bad form, in my opinion. There’s a downside to having co-workers think you are sending mail from an iPhone. I had several e-mails from a co-worker working remotely over a few days and a few had the “Sent from my iPhone”. I knew exactly when he was actually working and when he wasn’t. If all of the e-mails had that signature, I would have thought he was never working. Another thing one can try is simply answering concisely, without apology or deceit. Where is it written we are obligated to answer every email, however inane, with an effusive response? Another thing to improve eMail reading is to NOT quote whole mails and instead only quote the necessary parts of the mail and answer them. This would make reading the eMails easier! I hate those signatures and always disable them immediately on my own devices. I just want an answer to my mails. I don’t care if the answer is short or long or from which device the answer was send. If a short answer is enough to answer my question, I don’t expect the other person to add a lot of crap I didn’t ask for. A short answer can be ok, no matter from what device it has been send. I don’t care which device I use. I send short mails from my Mac and very long mails from my iPhone. I disable these because I think it looks tacky, at least for my industry. Don’t feel bad about writing a short email. Who cares if someone writes you 4000 word essay? If you can respond in one sentence, good, do it. If you’re the ‘passive-aggresive’ type (which seems to be a social norm nowadays), then it makes sense that someone who is sneaky/non-confrontational would find this method of use. Or, if you get over 100 emails a day like I do. But if you have a better trick to manage email overload, we’d love to hear it! I prefer “Sent from my friend’s iPhone”. Anyone knows how to disable DataDetectors in in Mail on OSX 1.8.3? Nobody seems to know, and Google doesn’t return anything either.